Whenever I am out & about since I still possess a residual amount of sight, I can sense people staring. But I just keep moving onward past the expectations of others and how they ‘think’ blindness should appear. 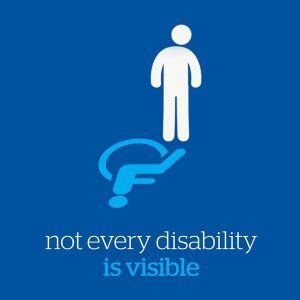 Recently I became a contributor to The Mighty an online community of people who share their stories of serious health conditions, disability, disease, and mental illness. The article below is my latest entry on what caused my sight loss and life after the “there’s no more we can do for you” conversation. It was a little over 48 years ago when I put on my first pair of eyeglasses, and the feeling of seeing clearly for the first time was indescribable. The transition was like leaving a dark movie theater and stepping outdoors on a bright sunny day. My eyes needed time to adjust to everything suddenly appearing clear and focused. For 36 years, I enjoyed perfect vision provided I wore corrective lenses. That all changed 11 years ago with two words: macular hole. It began when I removed one of my contact lenses, and I looked in the mirror to see half of my face missing. While I had never heard of a macular hole before, I learned the macula provides the sharp, central vision needed for reading, driving and seeing fine detail. A macular hole is a small break in the macula, which located in the retina, is the center of the eye’s light-sensitive tissue. Though all the statistics pointed to a favorable prognosis, it didn’t work out that way for metounfortunately. I’m reduced to counting fingers, since I can no longer see the eye chart. Developing macular holes in both eyes has destroyed my central vision. I’ll never forget the devastating news. “Ms. McCoy,” the doctor said, “I’m so sorry to tell you there is nothing more we can do for you.” Those simple words confirmed my worst fears — I was now legally blind. The doctor told me I lived with high myopia (extreme nearsightedness) all my life. He went on to say that even though I did all the “right things,” due to the high myopia, macular holes, surgeries and glaucoma, my vision loss was irreparable. Prior to losing my sight, I used to think that when a person used a white cane, it meant they were totally blind (no light perception). I was wrong. The range of sight loss is enormous and differs greatly from one person to the next. There really is an immense gray area. To give you an idea of my sight loss, imagine yourself in a dense fog with visibility being only a couple of inches in front of your face. Your equilibrium is off and your steps unsure. You feel claustrophobic, as the fog is so heavy. Stumble, fall, repeat. It’s unending, and you wish it would just go away. You wake with it, you go to sleep with it and in between waking and sleeping you have to come to terms with the fog. Once you acknowledge the fog is not going to dissipate, you find a way to navigate through it by learning new techniques. With time and patience, you gradually adapt until you become adept at working within the fog. To the outside world you “look” as if all is well and you can clearly see. And since you use a white cane to safely navigate the world, many times people will say to you, “But you don’t look like you’re blind. People don’t understand how I can dress stylishly or put on my makeup. The expectation that all blind people have to appear or behave a certain way is a huge misconception. Quite simply, the people we were prior to the loss of our vision, and the things that brought us joy, are still intrinsic to who we are today. What I’ve found since losing my sight is there are so many stylish women who are blind or have sight loss that I felt it was time for a fashionable icon to represent them. Abigail, the white cane icon and mascot on my blog Bold Blind Beauty, is a beautiful image that evokes power, independence, chicness, confidence and success — a woman on the move stepping forward with purpose. Once, an eye doctor told me that it would be a tragedy for me to learn how to use the white cane when, in fact, I believe the real tragedy is the shame many people feel when losing their eyesight. Having a visual image that evokes beauty, confidence and purpose is one way to change the stigma surrounding blindness. Just found you from a comment on another site (which I found from a reblog from ANOTHER site), good sense of networking I suppose. I appreciate your insights and compassionate patience. Wonderful article Steph. I always love your easy and honest writing style..pleasure to read! Terrific post, Steph. I’m honored to walk beside you in the journey of accepting vision loss and advocacy in the community. Love your style. Great post Stephanae. There is something quite powerful when one embraces challenges throws at us. And you’ve done it with such style, flare and confidence. Well done. This is my first time reading your blog post, it is really an amazing post! I really enjoyed reading it. Personally, I am also someone with vision loss, but I have just come to accept my disability not long ago. Life can be hard for someone living with a disability, but I’m so amazed at so many of those people living with such a difficult life and can still remain positive. Looking forward to read more of your inspirational stories in the future! Yes! I am very very happy too! getting connected with many people who can relate because they also have vision loss and to share stories together, and to end the negative stigma. Letting people know that people with vision loss can live happy and successful life! I did! Also I messaged you as well, to reduce confusion! Great!! Just got it and confirmed. Sent to facebook, thanks for the post. My first reaction to the title was, “That is so incredibly disgusting.” Considering the activist you are, and how much you have given to your community, it must be exhausting dealing with ignorant remarks like that, yet again, after all that hard work. People who say these things don’t realise they’re being unkind and that’s unfortunate. Lovely reflection, Steph. It’s important to keep those reminders going. There are so many examples of how stereotypes and limiting ideas get in the way of potentially great connections. Have a Tuesday full of understanding. “…to help people understand we are all more alike than different…” This is huge. Thank you. I always enjoy your work! Have a blessed evening as well. Awe thank you Terry and the feeling is mutual. By the way are you on Facebook by any chance? OMGosh, don’t even get me started on depression. But then again for many years I kept it very close to the vest because I was ashamed of my depression. Hahaha, yeah, I’m pretty much the same way now. Mainly because I’m tired of pretenses and once I turned 50 I really didn’t much care. And you’re right it is an illness. This is an awe inspiring story. Yes, I too have to deal with the fog. It’s frustrating as all get out; but still not looking like I’m blind. You always do a good job telling your story. You are amazing, Steph! “Abigail” is quite wonderful too. Keep up the awesome and inspiring work, my friend. Thanks Robert and you’re welcome for The Mighty introduction. You need to check them out as I know you would be able to give them some good material. More awareness must take place. Thank you Kerry! We will get there with orgs like Blind New World I believe it’s going to happen.